Love the colorblock system! Received this about 2 weeks ago and changed my nail color that day and my pedicure still looks fresh. No chipping whatsoever! On those rainy work days, i wear heavy hiking boots and was sure the polish would chip, but hasn`t so far. I am impressed with this system and recommend it to all. I haven`t had the problems that some people have mentioned. Now that i found this, i will not use any brand. Once my mini system is gone, I will by the refills on all. I love Zoya`s polishes and Color Lock system, but there is one huge flaw to it. I`ve used it the last two times I`ve done manicures on myself, and there is a ton of bubbling. I`m not sure what I`m doing wrong, but there is literally bubbling under the polish on every single finger. I did find online that someone tried thinning out the Anchor base coat and Armor topcoat, so I am going to try that with more time in between applying each layer next time, and see if that makes a difference. Otherwise, I love the Remove , and the fast drying drops worked well, but I just did a manicure an hour and a half ago, and I can still dent the polish though it is dry to the touch. Again, it might just be because the topcoat is thicker than it should be, so I`ll have to try it again! Zoya Color Lock SystemLOVE THE COLOR LOCK SYSTEM!!! I haven`t done at-home pedicures in several years, but I saw this kit and thought I would give it a try. Boy, was I pleasantly surprised!!! The first pedicure I gave myself with the color lock system lasted so long that I decided to take the polish off to try out my other Zoya nail polish colors!!! Since I`ve been using the Color Lock System, I haven`t experienced a single chip, nor do my pedicures show any signs of wear (and I have been wearing lots of sandals this summer!)! I love this system, and really hope they don`t change it. I look forward to my spa night at home at least once a week!! Thank you, Zoya!!! Zoya Color Lock SystemA MUST for my Mani Tool Box! Now that I`m using "3-Free" polishes (Formaldehyde, Tolulene & DBP free), I find that you have to put in a bit more prep work to get a good, lasting mani. 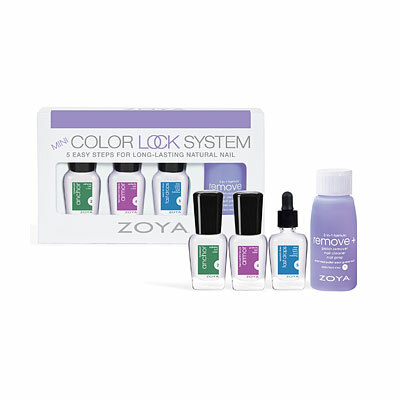 Thanks to ZOYA and their Color Lock System, it`s a breeze. Some may balk at the cost (currently $48 dollars) but it is WELL WORTH IT. 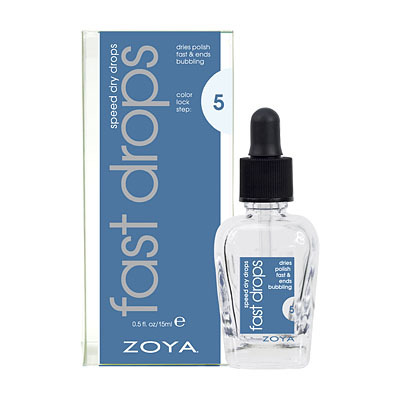 Zoya`s Remove is called 3 in 1 because it is a polish remover, nail cleaner and nail prep. If I don`t use this right before polishing, I do a good handwash. But most of the time, I`m removing one color anyway. This stuff ROCKS. Not only does it not stink like traditional removers, it actually smells nice! It`s also very gentle on my nails. And the huge bonus--their Flipper bottle is such a unique design--you twist the top cap, hold your cotton ball over the hole and gently pump. Twice soaks a large cotton ball--plenty to take off most polish jobs. If there`s lots of glitter, sometimes a bit more is needed. I haven`t figured out how to get enough out for a q-tip to clean up my nail edges without spraying my freshly-painted nails--but so far, no damage. 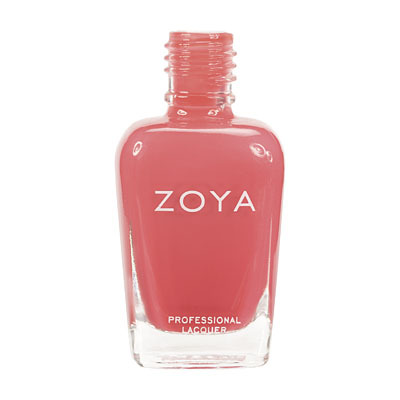 Zoya does sell a large refill bottle. This definitely gets an A from me! My next absolute favorite item is the Get Even Ridge Filler. Despite buffing I still have ridges. Between my age, my chronic illnesses and medications, I have ridges. But beyond filling, this is an amazing base coat. It`s a light milky white, so it doesn`t really affect any color you`re going to paint with. One quick coat on each nail is all I need. It dries so fast that by the time I`m done with my other hand, the first hand is nearly dry. I actually prefer this to the Armor Basecoat--I don`t know if the fibers really do help keep my polish strong, but I think it makes my nails stronger in general. Finally, the Renew is excellent and does just what it says. I`ve gotten some polishes that despite some good shaking, really didn`t go on smoothly. I add a dropper of this stuff and WHAM good as new! A word of caution--even though the included dropper CAN screw on the bottle, I strongly advise you do NOT leave it on. My bottle must have tipped over or wound up evaporating. So--lesson learned, keep the original cap ON. As for the Anchor and Armor, they are just fine. I have no complaints. I`ve just found that the Ridge Filler dries faster than Anchor, and sometimes I find the Armor "dulls" the shine of some of my glitters. In addition, since I love mattes, you can`t add a topcoat or it defeats the purpose of the matte finish. All this comes in a handy bag with complete instructions on how to use each product. They are also sold separately, but of course it is cheaper to buy them as a set than one at a time. Zoya Color Lock SystemI`m so sad! Zoya is so dissapointing to me! I LOVE their nail polishes. I own about a dozen and they are easily the prettiest and most unique in my collection, but I just can`t find a good base/top coat combination for them. I`ve tried several and eventually decided that I should just get the color lock system. If you can ever get this to dry it might work quite well, but even with a very generous amount of the drying drops my nails, over two hours later, were still so wet that the polish smudged and pulled off when I hit hand against something (not even that hard). I just can`t wait over two hours for a polish to dry, it`s just not worth it. I wish I hadn`t wasted my money on all this beautiful polish I won`t be able to use. :( I`m glad it worked well for other people, but here`s the other side of the coin... for me the dry time was excruciatingly slow. I took off my acrylics a year ago, been trying to get my nails back to healthy. Found Zoya just a month ago and decided to give it a try. Love the colors but now I want to save cash so I decided to do my own nail. What a great system this is. Had a salon do my nails with the system the first time and manicure lasted a full week with NO chips. I did my own nails the second time and after 5 days had only 1 tiny chip in right ring finger and one small chip on left middle finger. I truly believe it is all due to the full system usage. Don`t use this is you hate your polish and want to (need to) change your polish the next day heheheheh but I`m happy to say having a manicure last more than two days is the best!!!!! Thanks Zoya. Until trying the Color Lock system, I had pretty much given up on keeping my nails polished and professional looking. I tend to want to re-paint as soon as the first chip occurs. I`ve had my current polish on for five days and have no noticeable chips and the color still looks great. I will definitely order full size when I use up this set. I had given up on regularly having my nails painted. Between taking care of my home and my family, school work, and my job, within a day my nails would start chipping and peeling - and looking terribly unprofessional. I purchased the large color lock system to try out before I purchased as a gift, and I cannot rave enough about it. Now I can change my nail polish because I want to, not because the previous color is cracked and chipped and peeling off. I can even have a nail chip or break, and the nailpolish still looks wonderful. I have only been using about 2 weeks, but I feel my nails are feeling stronger and looking healthier as well - bonus! I plan to never be without this, and am pleased to have found a great all-purpose gift for ladies this holiday! Zoya Mini Color Lock System - Holiday MinicureMini Kitness! I was completely unprepared for how adorable the Minicure set would be! I would like to warn that the bottles are a cute half size of the regular ones, but overall the system is great! 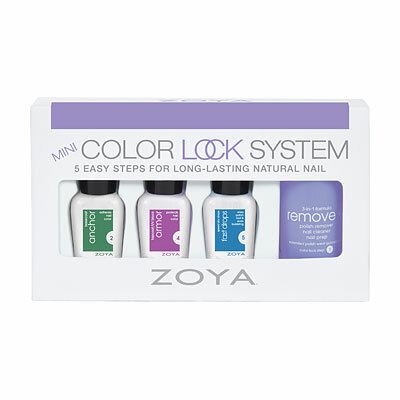 Zoya Color Lock SystemTHE best nail system Anywhere ! I stopped getting acrylics two years ago and a year later tossed all my other nail products to use Zoya exclusively and in six months, my nails are the best they`ve been in my life and I know I`m not poisoning myself. I tote my whole system to the manicurist, plus my color de jour and even they love it over Opi and others. Use the whole system. It works, your mani LASTS and you and your nails are miles healthier. I put this off for a long time due to the price - now I wish I hadn`t. After 6 days there is only minimal tip wear, and no chips or peeling. I`ve never had results this amazing, and I`ve tried everything. (I am just an average do-at-home manicurist, no professional .... I`m sure if you know what you are doing your results may be even better). I have been using the Color Lock System for 6 months and I absolutely love it! My manicures last much longer than when I used Seche Vite and Remove is fantastic! I`m hooked!